There is approximately 100 km of chiller water pipelines in our plant with pipe diameter ranging from 50mm to 300mm. These pipelines are distributed all over the plant at a height of 20-50 m from the ground. The pipe network has welding at every 6m along with bends and pipe fittings. 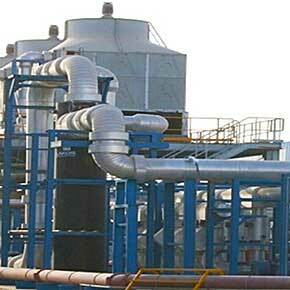 The ambient temperature around the pipeline varies from 40-75 °C. These water lines are insulated with thermocol, steel wire mesh and the outer layer with cement or Aluminium sheet. Many a time, there is condensation at the surroundings which lead to rusting and weakening of the pipe. The supports of pipelines are metallic and have no insulation which causes condensation and hence rust. Since the chiller water lines run all across the plants, leakages can lead to water ingress and damage the spares/equipment. The breakdown in the chiller water network poses a serious safety issue due to the location of the pipelines in places like torpedo area, or near the power rails of EOT cranes. Currently, the insulation has to be ruptured at random places to know the condition of the pipeline. After measuring the thickness using ultrasonic testing, the pipe is re-insulated at the ruptured portion. If ultrasonic testing is used directly on the top of the cemented portion, variation in thickness measurement readings is huge due to the metallic portions of wire mesh and support hinges. Hence, the accuracy of the readings is doubtful. Moreover, the current method is time-consuming and requires a lot of re-work.